Yes, we seem to have fallen behind again. We can talk more about that on some "Friday." For now we'll catch up with the rest of our Catalan prints and some additional Menger prints before getting on to new designs. 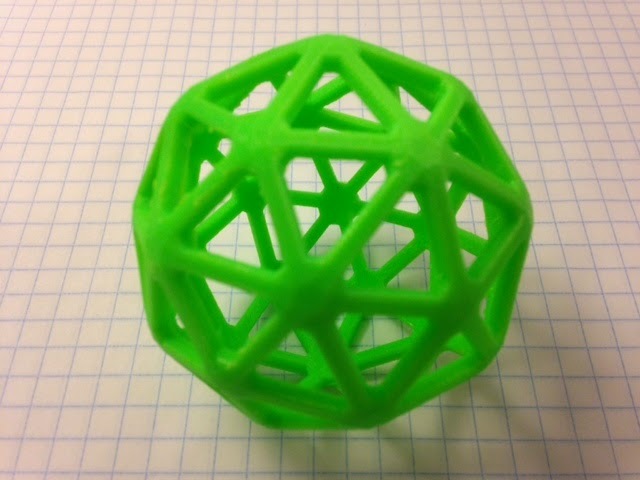 pmoews, who has over 160 designs on Thingiverse that include beautiful designs of every type of polyhedron or geometric figure that you could imagine. pdragy, whose recently Thingiverse-Featured extensive design collection Customizable Convex Polyhedra was the inspiration for the wireframe models that I have been making. kitwallace, who has written some beautiful OpenSCAD code for Generated Polyhedra that works very quickly even for very large models, and who will soon be contributing a guest post to this blog to talk about those designs. Today's Catalan solid is the Pentakis Dodecahedron, dual of the Truncated Icosahedron (aka "soccer ball,' aka "football," depending on where you live).